Loud “whi whi whi whi whi” whistle. Description: Sexes similar. Bold facial pattern of a striped crown and dark eyeline. Long decurved bill. Brown above with buffy mottling; pale below with buffy streaking on neck, breast, and sides. 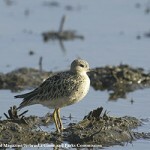 Habitat: Migrants can be found on flooded grasslands, sandbars, mudflats and shorelines. 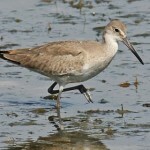 Where in Nebraska: Rare but a regular spring migrant primarily during May. 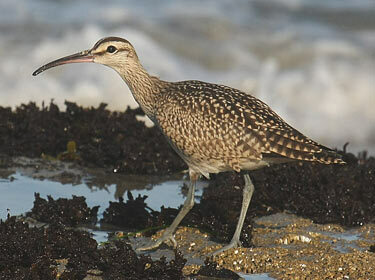 Field Notes: Whimbrels nest in the Arctic tundra, where they scrape out nests in short vegetation. 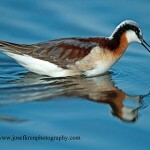 Fun Facts: When the chicks hatch they are fully feathered and may leave the nest within one to two hours of hatching.